Happy Thanksgiving! This product was created with Kindergarten students in mind. 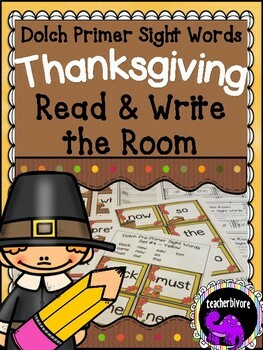 It includes Thanksgiving/Fall-themed sight word cards for all 52 words on the Dolch Primer list and two activities to go along with them: "Read the Room" and "Read and Write the Room". 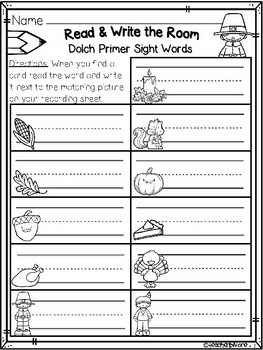 Both activities include printable student recording sheets and detailed instructions on how they can be used in the classroom. 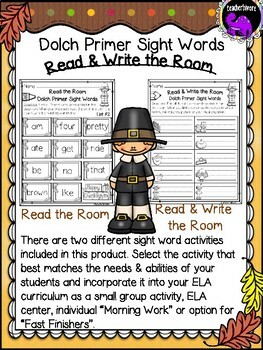 This product can easily be incorporated into your ELA curriculum as a small group activity, Center, Morning Work, or Fast Finishers option - Great for sight word practice and review!